The family dinner. Not as easy as it sounds. Husband works late. Two teen sons scatter in opposite directions. Sound familiar? Want to know how it all turns out? See the blog for comments from the fam or check out the Meal Plan page for menu ideas. Sustainability is one of those words that invites discussion. I’m not thinking about environmental policy or continuous business improvement. Or even the source of our seafood. What I’m playing around with these days is how to sustain the commitment to healthy eating day by day while juggling the realities of work and family. We got off to a great start this week. Two days in, I’m thinking I could eat like this for a lifetime. Monday: Grilled tuna steaks and toasted farro with kale and currants. Tuesday: Lemony shrimp and cannellini beans over quinoa plus roasted broccoli. What’s not to like? Both meals fit my anti-inflammation goals. But is this way of eating sustainable? From a budget perspective, no. And at this point in our lives, it’s a challenge to come up with meal plans that all three men like. It turns out the boys weren’t around right at dinner time so I was really cooking with me and my husband in mind. The guys did show up eventually and eat, but not too enthusiastically. Not sure if it was the timing or the food … probably a bit of both. Tuna is not “steak” but I was confounded why the shrimp wasn’t a hit. Seems what I’m really striving for here is to “sustain” my energy in putting dinner on the table while meeting the myriad goals of a busy lifestyle, great health,and a reasonable grocery budget, not to mention the idiosyncrasies of the teen diet. How’s that for a twist on sustainability? “You know, this would be better if it had chicken in it.” Son #1 was peering at a serving of Thursday night’s meal of cauliflower and carrot curry, prepped quick in the pressure cooker, and served with fried tofu strips and basmati rice. I pondered: Doesn’t chicken taste like everything? I figured the tofu could substitute. Wrong. “Yes, I tried it. It tastes like grass. Exactly, precisely like grass.” Son #1 again, offering his opinion of tonight’s raw Tuscan kale salad. Freshly sliced lacinato kale, tossed with pecorino cheese and fresh bread crumbs – simple and delicious … to the adults, that is. I don’t give up easily. I figure they’ll either come around or start cooking. Now that’s the right idea! “I’d rather eat this than fish.” Son #2 was digging into his second serving of braised greens during a Sunday dinner that was atypical, even for me. 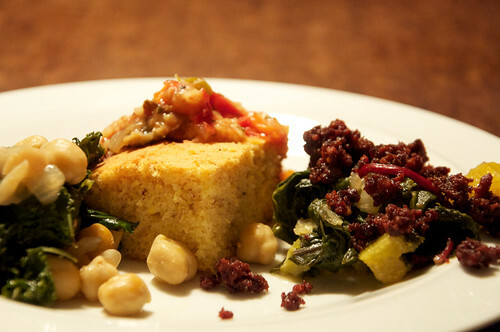 Braised chard with chorizo + braised kale with chick peas + tomato vegetable bulgur sauce + cornbread. All made possible by a husband willing to do all the chopping in advance (fulfilling my TV chef fantasy) and the tomato sauce stashed away in the freezer after this summer’s tomato rush. Prepping the greens separately wasn’t in the original plan — chard and kale can happily co-exist in any braised greens recipe — but the chorizo created controversy. “There’s nothing healthy about chorizo,” my husband said, looking askance at the label. True, there in tiny print was mention of pork snouts or some other odd part or two. I knew I was breaking every rule in the A-I (anti-inflammatory) eating plan to include the scandalous Mexican chorizo but I knew the recipe was a good one. Besides, my nutritional profile was doomed from an afternoon dusted with sugar and flour, baking cookies with the boys. Let’s just finish the day with a mysterious organ meat and start over tomorrow, I figured. Good plan. 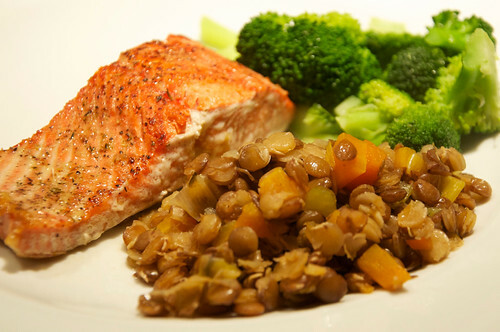 Both greens dishes got a thumbs-up, a far more enthusiastic response than our intentionally healthy plates, such as roasted salmon and lentils. A disruption here and there — whether it’s sugar or organ meat — seems to keep family appetites in check. “Mom, don’t put this in your blog.” Son #1 was earnest and I was amazed. I had just labored, much longer than usual for a weeknight meal, over an extraordinary (IMHO) broccoli-basil mac ‘n cheese casserole. Cheddar and swiss cheeses blended with a bit of sour cream and cherry tomatoes. Mixed into hot whole wheat pasta shells with pureed butternut squash and topped with a blend of broccoli, basil and bread crumbs before a turn in the oven. I should have known. 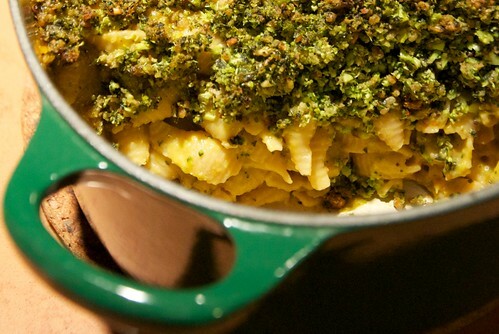 The dish was touted as a healthy alternative to traditional mac n cheese, thanks to the sneaky squash and green crumb topping. The boys didn’t fall for it but it didn’t bother me (thus, the blog post). I had caved in the previous night with a dinner featuring pork tenderloin, noting it was only the third or so time for pork since we started the anti-inflammatory eating plan back in June. “Yeah, I noticed!” pipes up Son #1 again. He doesn’t miss much in the kitchen. I figure there are trade-offs if we’re going to stick with our A-I eating plan. Last week my husband was away so the boys got three nights of traditional eats: chili, spaghetti, boiled sausage dinner. 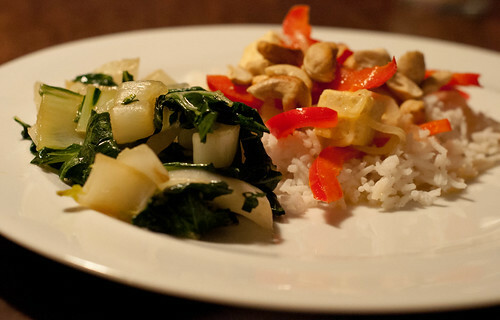 Then hubbie reappeared and we returned to a favorite recipe from our still-new adventures in anti-inflammatory eating. It’s a quick dish of chicken with tomatoes, roasted red peppers and almond butter. What makes it special is the spice step: Cumin seed, fennel seed, and coriander are sauteed in oil before rest of the ingredients. That simple step gives the meal a flavor boost that earns a thumbs-up even with my teen sons. Now that we’re heading into the deadly holiday feasting season, I’ll be looking for ways to sustain our commitment to our new eating plan without sacrificing flavor. 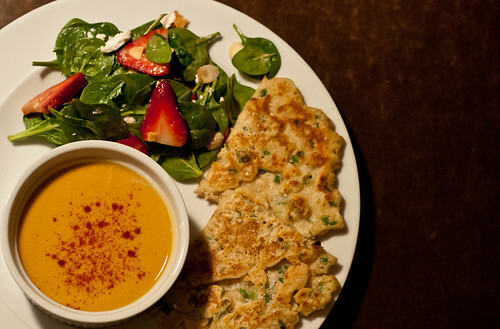 Time to create a “best of” list with the dinners we all agreed are tasty. And time to stock up on healthy snacks so I won’t munch on the cookies and candy that inevitably land on our doorstep this time of year. It’s a balancing act for sure.